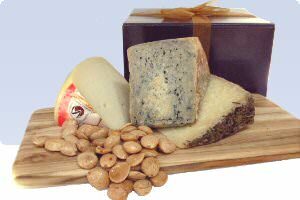 In our Glossy Burgundy Gift Box you will find a combination of cheese and accompaniments from Spain. Drunken Goat - 8 ounces of a young cheese, made of pasteurized goat's milk that is soaked in Monastrell wine for about 3 days. Fig Almond Cake - whole premium Pajarero figs and Marcona almonds pressed together in a small 8-oz cake. Idiazabal - a lightly smoked sheep's milk cheese. Marcona Almonds - Spain's most precious almonds; fried and slightly salted.